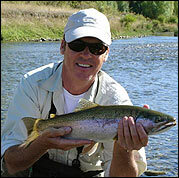 Chappie Chapman's Flyfishing school in New Zealand. The course suits those wishing to start fly fishing, through to anglers of some years experience who want to improve their basic skills. This course is two days 9am - 5pm. Approximately 8 hours is indoor in a lecture/discussion group and approximately 6 hours on the water fly casting. The course has a maximum of twelve people. The tutor is Chappie Chapman who holds international fly casting and instructor qualifications. Modern Casting techniques....Roll cast, Pick up and put down cast, False casting, Shooting line, Line control, Hooking and controlling fish. Rod Reel and line, the difference and performance, General equipment, Discussion, Knots, Correct tapered leader construction, Indicator fishing, River fishing, Lake fishing, Reading water, Entomology. For those who require it we supply equipment including top of the range Sage & Loomis, reels and lines. A light lunch and morning and afternoon tea is provided. You will need to bring clothing, and footwear for outdoors, pen and notepaper, and if you wish your own fishing gear. The online booking page is protected by certified THAWTE certificate & is totally safe.